Lisa Powell with her computer-assisted, longarm quilting machine. Lisa Powell, a stay-at-home mom from Lake Stevens, Washington, is working her dream job -- she quilts using a longarm quilting machine right out of her home. After stumbling upon the opportunity while at a quilting retreat, Powell decided to expand upon her talents and open a small business. 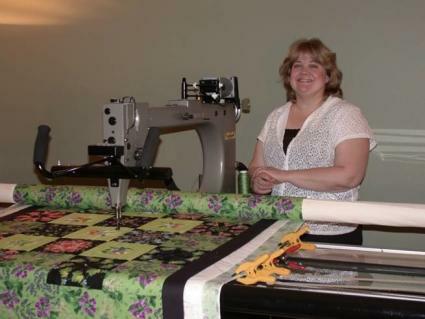 After purchasing her longarm machine from a fellow quilter, she started Quilty Pleasures in January 2007. Besides quilting, she enjoys tae kwon do and homeschools her three sons. Even though she started her business only a few months ago, Lisa Powell took some time to answer a few questions for the readers of LoveToKnow Crafts. What is computer-assisted, longarm machine quilting? It is very precise every time. It allows me to work on other things while it sews to an extent. I can't just go off and leave it, but I can take my hands off of it. I homeschool my kids, so with this type of machine I have more freedom to work and work with my kids at the same time. I can start the machine on a quilt and work with the kids on their lessons as it sews. There is a much shorter learning curve when quilting with the computer. 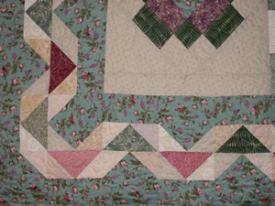 Hand-guided quilting takes much more practice to be able to do it well. 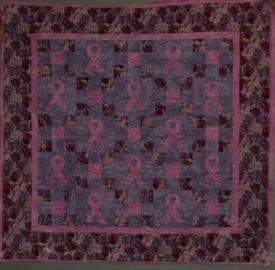 Using the computer allowed me to start my business much more quickly than I would have been comfortable with if I were doing hand-guided quilting. I treat my customer's quilts as if they were my own. 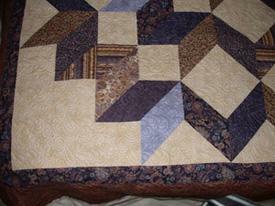 Many hours of work goes into piecing a quilt top, and good quilting fabric is expensive. They are working to create an heirloom. I would never want to quilt for anyone unless I am confidant that I can do a good job and finish it with quilting that makes a beautiful product. With a computerized machine, I was able to get to that point more quickly. 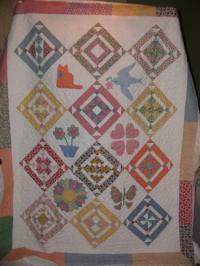 Powell purchased her quilting machine in 2006. With the rising popularity of embroidery machines, why should someone have their quilt professionally finished instead of doing it themselves? While you can get some quilting accomplished in an embroidery machine, it is definitely limiting. You are limited by the size of the hoop. Also, if the quilt is very large, it won't fit in the machine. A home embroidery machine can be helpful and fun for quilting a very small project, but it just really isn't feasible if the project is very large. In many ways, it is more trouble than it is worth to do it that way. How long does it take to do a standard-size quilt? That really depends upon the density of the pattern. 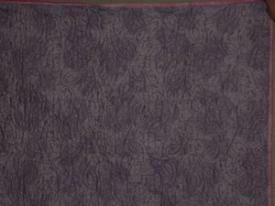 I typically do edge-to-edge quilting designs, so it is the same design repeated all over the quilt. Custom work (different designs in different blocks throughout the quilt) takes longer, so a quilt with custom work often takes several days to even weeks if it is very complex. For the computerized edge-to-edge designs that I usually do, I would say five to six hours on average. I did a huge king-size recently that was pretty densely quilted, and that one took about 14 hours quilting time after loading it onto the machine. Loading a quilt that size takes several hours to get everything on straight and set up correctly too. How do you pick the pattern? Are there many to choose from? I usually have my customers pick what they want for their quilts. The options are really limitless. 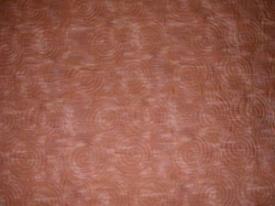 I have some patterns on my Web site, and I have several more that I haven't gotten up there yet. Additionally, if I don't have what a customer is looking for, there are many pattern vendors that sell most anything. If a customer doesn't find what they are looking for from existing pattern vendors, then we can try to create it for them. I have a customer right now who made a quilt for her boyfriend and wanted him to decide how he wanted it quilted. He could not find exactly what he had in mind, and he is an artistic person. So, he decided to draw out the pattern that he wanted on the quilt. I took his drawing and digitized it, and we are going to quilt his own artwork into his quilt. So, like I said, the options are limitless! 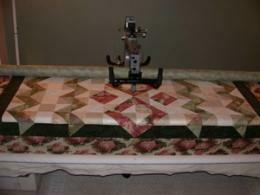 How did you get started doing longarm quilting? I got started by fluke, really. Owning the machine I now have has been sort of a dream of mine for several years. However, I didn't really think I would have the opportunity to make it happen. In September 2006, I went on a quilting retreat and through a conversation, I found out that another member of our group was selling her machine. So, I started joking that I was going to go home, buy it and start a quilting business. I think I started practically every sentence at that retreat with the phrase, "When I get my longarm….."
I really was joking, but the idea took ahold of my brain, and I went home and mentioned it to my husband. I think I worded it something, "Would you think I had totally lost my mind it I said I wanted to buy a longarm and start a quilting business?" I showed him the machine I was looking at online, and he did some research, and soon. I think he was more excited about it than I was! So, we calculated how we could make it work financially, and I went for it. I have never regretted it for a second. I am having so much fun! This truly is my dream job! How was opening a home-based business an adjustment to not only you, but your family? It has been a bit of an adjustment with the kids since my focus is somewhat divided when I am trying to work and homeschool them at the same time. They are getting used to it, though. I think the biggest adjustment for them is keeping quiet if I am on the phone with a business call. When did you go into business for yourself and why? I purchased my machine at the end of October, and I moved it to my home the week before Thanksgiving. In the interim, I was training on it at the seller's shop. I worked on the machine getting used to it and how it worked and practicing on my own quilts, as well as charity quilts through the end of the year. 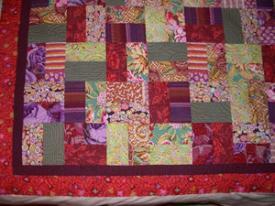 I started quilting for customers in January 2007. It is nice to be making money for all those little extras that are difficult to squeeze into the family budget. I had to go into business in order to pay for my machine. I went into this business because I really love quilting. I am having a blast quilting for others and seeing what they create. Any tips for those interested in taking up quilting? My biggest tip for someone interested in learning to quilt is to take a class at your local quilt shop. There is so much you can learn easily from a class that is difficult to really pick up from a book. I guess my big disclaimer is that my Web site is still very much a work in progress! Since I am just starting out, I am really not in a position to hire a pro to do it for me, so I have had to figure that out as I go along. So, you can get the basic info there, but it does not look as nice as I would like for it to. Someday, it will be perfect, but for now, it will have to do.